Muhammad bin Qasim was orphaned as a baby and thus the responsibility of his upbringing fell upon his mother. She supervised his religious instruction herself, and hired different teachers for his worldly studies. It was the uncle, Hajjaj bin Yousaf, who taught him the art of governing and warfare. command Muhammad bin Qasim displayed a talent for skillful fighting and military planning. 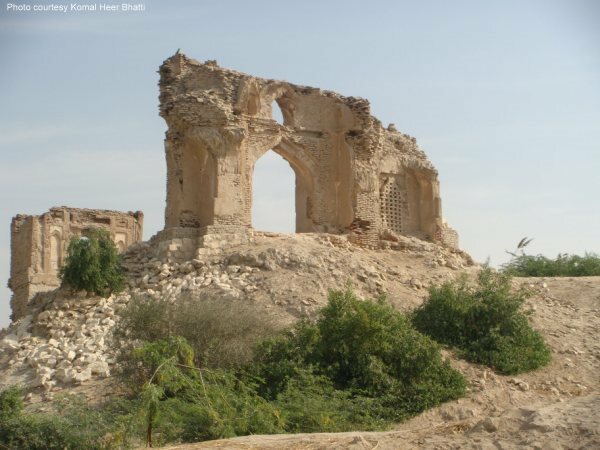 Hajjaj's complete trust in Qasim's abilities as a general became even more apparent when he appointed the young man as the commander of the all-important invasion on Sindh, when he was only 17 years old. 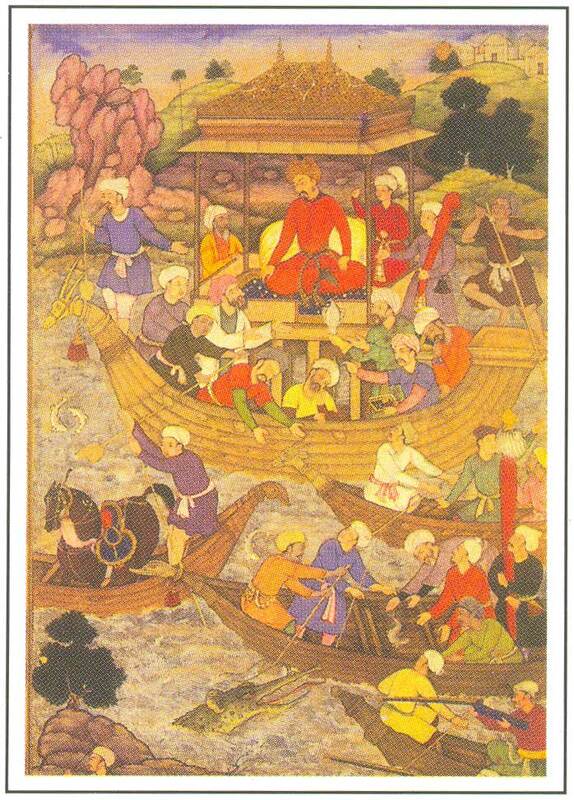 Muhammad bin Qasim proved Hajjaj right when he, without many problems, managed to win all his military campaigns. He used both his mind and military skills in capturing places like Daibul, Raor, Uch and Multan. History does not boast of many other commanders who managed such a great victory at such a young age. Besides being a great general, Muhammad bin Qasim was also an excellent administrator. He established peace and order as well as a good administrative structure in the areas. He was a kind hearted and religious person. He had great respect for other religions. Hindu and Buddhist spiritual leaders were given stipends during his rule. The poor people of the land were greatly impressed by his policies and a number of them embraced Islam. Those who stuck to their old religions erected statues in his honor and started worshiping him after his departure from their land. Muhammad bin Qasim was known for his obedience to the ruler. Walid bin Abdul Malik died and was succeeded by his younger brother Suleman as the Caliph. Suleman was an enemy of Hajjaj and thus ordered Qasim back to the kingdom. Qasim knew of the animosity between the two. He was aware that due to this enmity, he would not be well treated. He could have easily refused to obey the Caliph's orders and declare his independence in Sindh. Yet he was of the view that obeying ones ruler is the duty of a general and thus he decided to go back to the center. Here he became a victim to party politics. He was put behind bars where he died at age of 20. Many historians believe that had he been given a few more years he would have conquered the entire South Asian region. 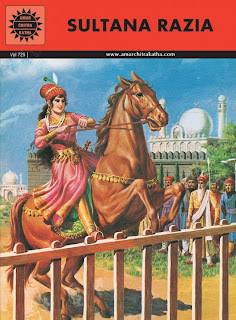 Daughter of Iltutmush, Razia Sultana was the first female Muslim ruler of South Asia. She was a talented, wise, just.brave and generous woman. She was a great administrator and was well versed in governmental affairs. She was not only a good leader in the battlefield but herself was also an excellent fighter. As the most capable son of Iltutmush died during his own life, and the rest were incompetent to govern, Iltutmush nominated his daughter, Razia Sultana, as his successor on the throne of Delhi. Whenever Iltutmush had to leave his capital, he used to leave Razia Sultana in charge of the affairs in Delhi. But when Iltutmush died, Rukn-ud-din Firuz, one of his sons, occupied the throne and ruled for about 7months. 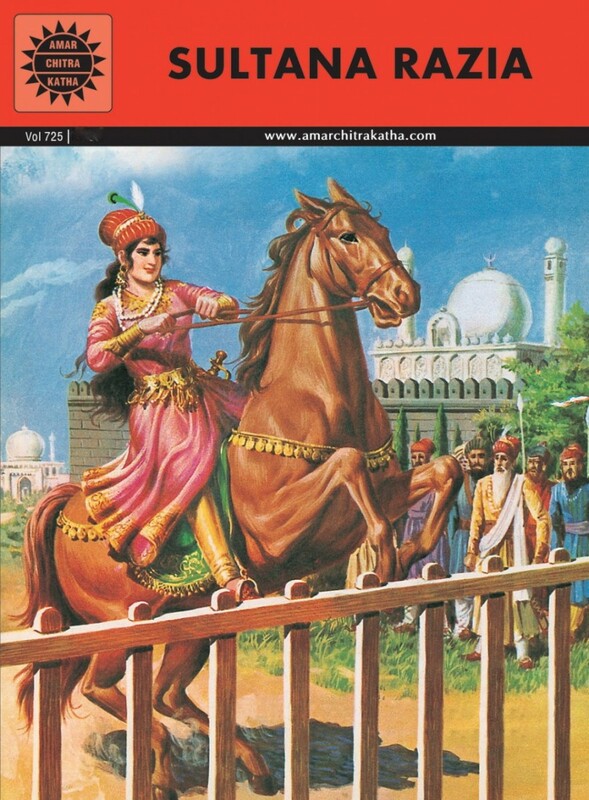 Razia Sultana, with the support of the people of Delhi, secured the throne after defeating her brother in 1236. To rule the country, she abandoned her femininity and adopted a masculine getup. She used to dress as a man when appearing in public, be it in court or on the battlefield. She made an Ethiopian slave named Jalal-ud-din Yaqut her personal attendant and started trusting him the most. The Turkish nobles resented having a woman as their ruler, especially when she started challenging. They began conspiring against her. 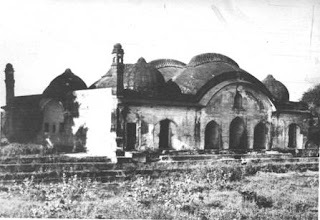 In 1239 the Turkish governor of Lahore rebelled against Razia Sultana. However, when she marched against him, he first fled and then apologized. Then the governor of Bhatinda revolted. When Razia Sultana was trying to suppress the rebellion in Bhatinda, her own Turkish officers deposed her from the throne of Delhi and made her brother Bahram the Sultan. 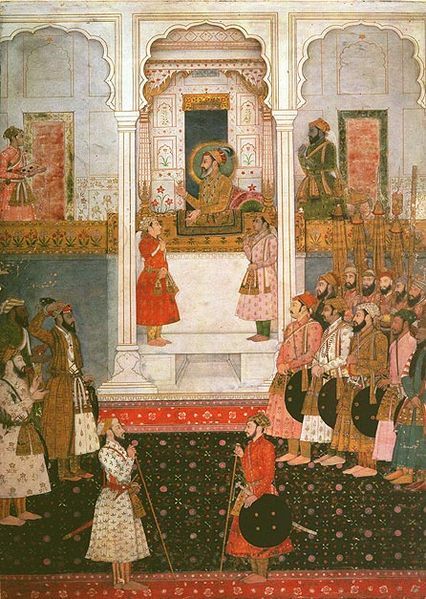 Razia Sultana married the governor of Bhatinda, Malik Altunia, and with his help tried to reoccupy the throne. She was defeated by the Turkish nobles and was compelled to flee away. A peasant who had offered her food and shelter while fleeing from an encounter killed her in her sleep. Ab'ul Hasan Yamin al-Din Khusrow better known as Amir Khusrow (or Khusrau) Dehlawi was an Indian musician, scholar and poet. He was an iconic figure in the cultural history of the Indian subcontinent. A Sufi mystic and a spiritual disciple of Nizamuddin Auliya of Delhi, Amir Khusrow was not only a notable poet but also a prolific and seminal musician. He wrote poetry primarily in Persian, but also in Hindavi. He is regarded as the "father of qawwali" (the devotional music of the Indian Sufis). He is also credited with enriching Hindustani classical music by introducing Persian and Arabic elements in it, and was the originator of the khayal and tarana styles of music.The invention of the tabla is also traditionally attributed to Amir Khusrow.. He has written Ghazal, Masnavi, Qata, Rubai, Do-Beti and Tarkibhand. 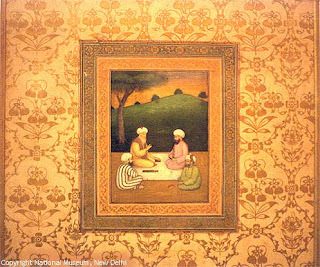 Ameer Khusro was born in Patiali near Etah in northern India. His father, Amir Sayf ud-Din Mahmud, as a Turkic Officer and a member of the Lajin (Lachin) tribe of Transoxania, themselves belonging to the Kara-Khitais. His mother hailed from Delhi. Born of a Turkish Lajin (Lachin) later Saifuddin Shamsi, Amir Khusro eclipsed all his predecessors. How to get my pot filled? In the furore, I broke my pot. 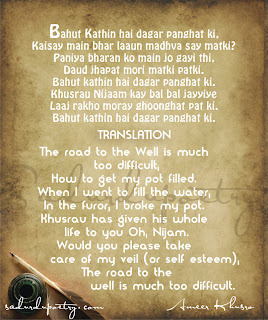 Khusro has given his whole life to you, O Nizam. 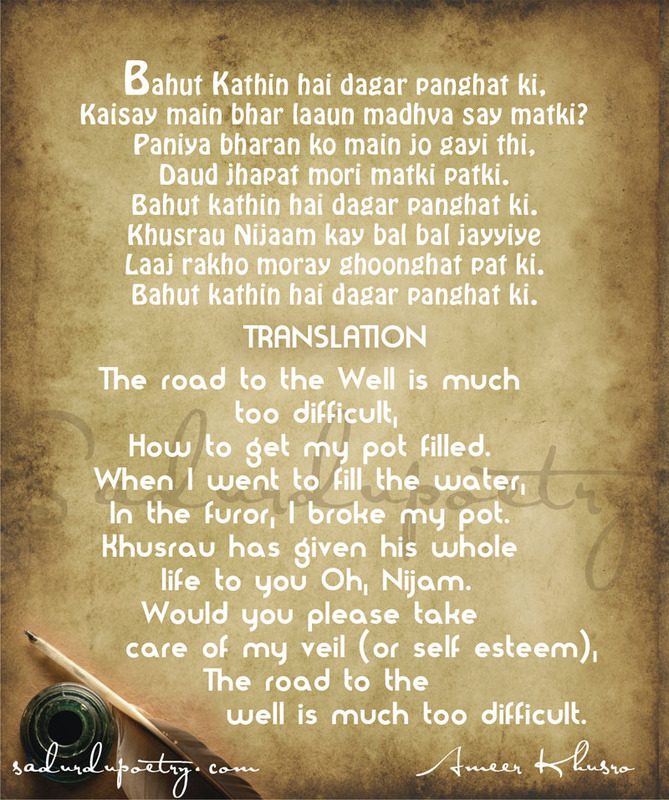 The road to the well is much too difficult. Dara dil-e dara dil-e dar-e daani. Ali is his master too." 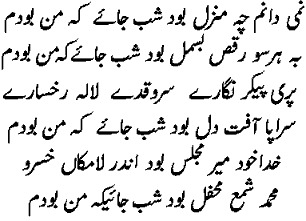 Poetry was inherent in Ameer Khusro. 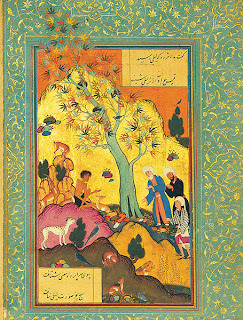 The day he was born, his father took him to a God absorbed darwesh, who said to his father, "You have brought one who would go two steps a head of khaqani (nightingale)." In his early childhood, Khusro had developed a putting together in verse form worse of discordant meaning. Up to the age of sixteen, whichever book of verse he happened to lay his hand on, he tried to follow its author in the art of composition. 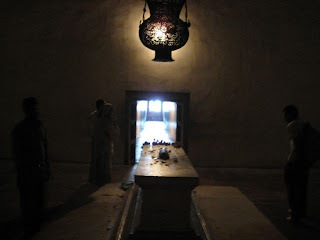 His adolescence ushered him under the guidance of both Mufti Muizzudin Gharifi and Hazrat Nizamuddin Aulia, his mentor. Both of them guided him to the path of following the style of Saddi and Kamal Isfahani. Even at that young age, he used to lambaste his contemporaries, including Hasan Dehlavi in qitah (quatrains). "….. He is considered as the pioneer figure of the Indo-Muslim music. In fact, it was he who started the process of synthesizing Turko-Persian music with Indian music. He has credited three books on music just as three diwans of poetry. 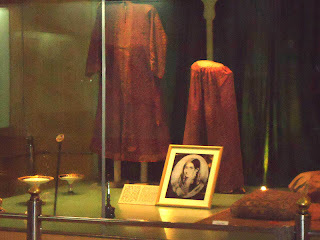 "My verses have so far been collected in three diwans, would you believe, that if there were a system of notation for registering musical compositions, my performance in the field of music too, would have been collected in three registers" He invented number of ragas and raginis which include such novelties as Qaul, Qulbanah, Taranah. He also composed verses in Persian and Hindwi. You've taken away my looks, my identity, by just a glance. Have been held tightly by you with just a glance. You've dyed me in yourself, by just a glance. You've made me your bride, by just a glance. Ba-umeed aanki rozi bashikaar khuahi aamad. 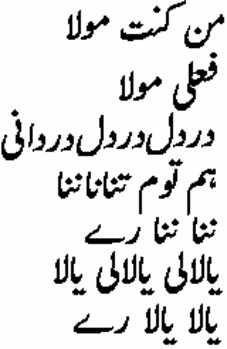 Ba-janazah gar nayai ba-mazaar khuahi aamad. Pas azan ki man na-maanam bacha kar khuahi aaamad. Be my head sacrificed to the road along which you will come riding! In the hope that one day you will come to hunt them…. you’ll definitely come to my grave. After I am no longer – for what purpose will you come? 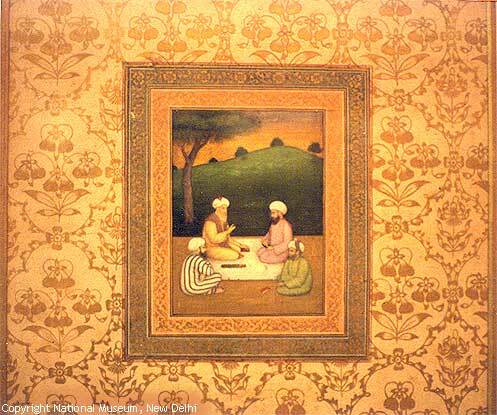 Ameer Khusro served as an ambassador of Hindu-Muslim unity in his time. His Hindu or Hindwi poetry for which he has been so popular among the school-going children as well as elderly generation. It was he, who himself called Tuti-e-Hind’ (parrot of India). ‘To speak the truth, I am an Indian Parrot. If you want to listen from me some subtle verses, ask me then to recite some of my Hindwi poems." He himself did not collect and preserve his Hindwi poems but made a gift of them to his friends. His love and respect for Hazrat Nizamuddin Aulia reached the apogee that when he heard about his death at Lakhnawati, he immediately arrived and went to his grave, where he blackened his face and rolled over in dust in utter grief, tearing his garments. Six months after that event, he died on Friday 29th Ziq’ad 725AH/1325. His death is not a death in the literal sense of the world for, he would always remain one of the very few unforgettable legends of literature. 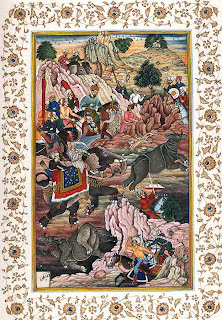 Zahiruddin Muhammad Babur, "Babur", meaning lion, was the founder of Mughal Empire in India. He was born in Farghana, now in Uzbekistan, on February 14, 1483. The Mughal Empire founded by him lasted for 331 years. 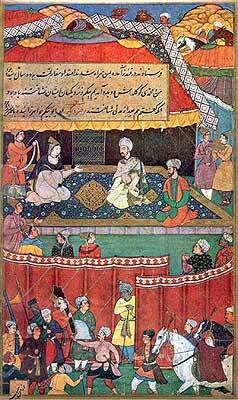 Babur was a descendant of Timur on his father's side and of Chengez Khan on his mother's side. When Babur's father Umar Sheikh Mirza died in 1494, he inherited the ancestral kingdom of Farghana. He was only 14 years old at that time. 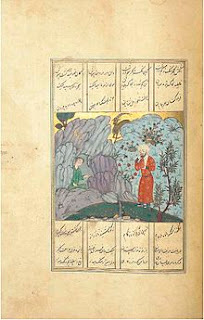 Babur faced many hardships during this period of his life. He was driven out of his father's state and for two years became a wanderer. In 1504, he came to Afghanistan and occupied Kabul. Here he assumed the title of Padshah. After crossing the Indus, he invaded India five times. 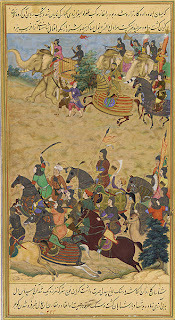 The fifth expedition resulted in the death of Ibrahim Lodhi in the first battle of Panipat, in April 1526. Panipat was merely the beginning of the Mughal rule; Akbar laid its real foundation in 1556. 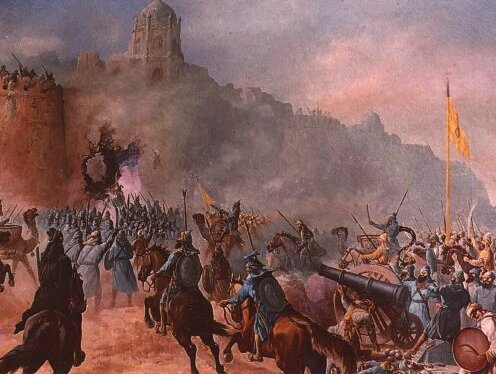 At the time of the battle of Panipat, the political power in India was shared by the Afghans and the Rajputs. 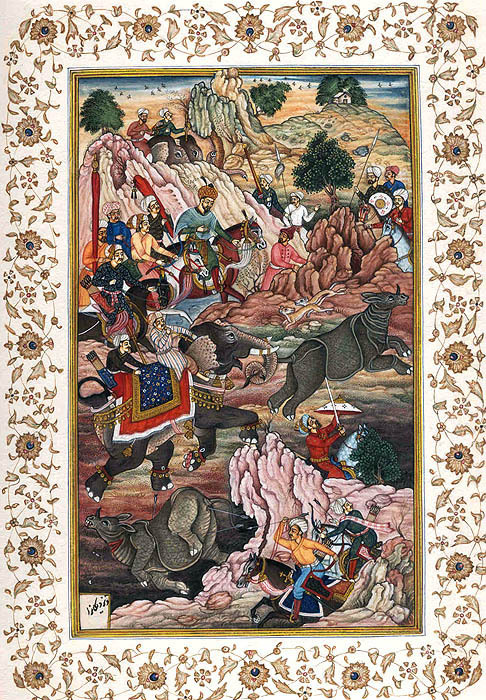 In the battle of Kanwaha, Babur defeated the Rajput leader Rana Sanga of Mewar. In 1528, he captured Chanderi from the Rajput chief, Medini Rao and a year later he defeated the Afghan chiefs under Mahmud Lodhi in the battle of Ghagra in Bihar. These conquests made Babur the "Master of Hindustan", and the founder of Mughal Empire in the Sub-continent. 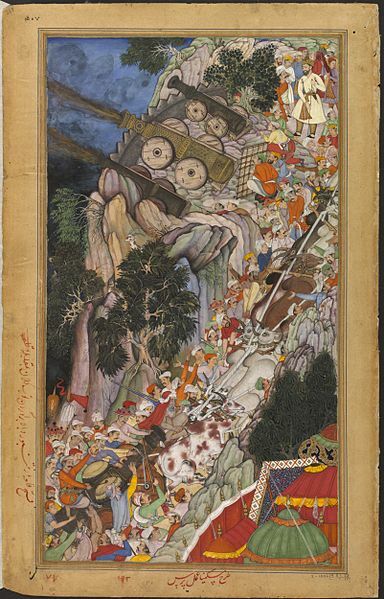 Babur did not live long. 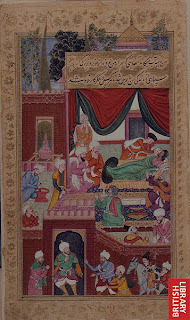 Towards the end of Babur's life, his eldest son Humayun fell seriously ill. It is said that in a religious ceremony, he transferred his son's illness to himself and sacrificed himself in order to save Humayun. 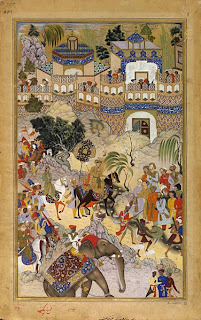 As Humayun recovered, the former became worse and after two or three months Babur died at Agra on December 26, 1530. 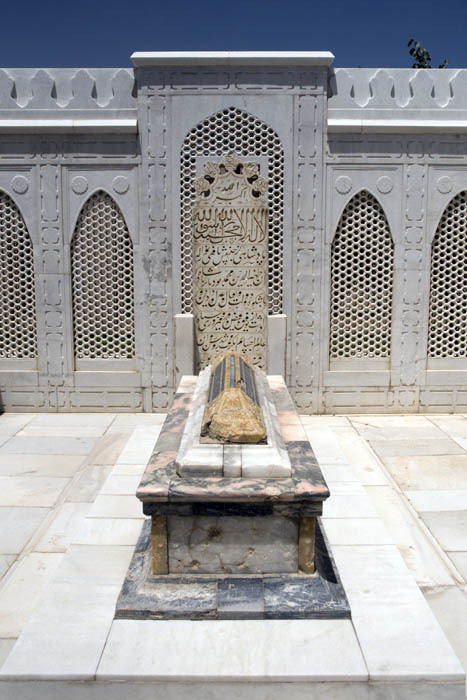 Babur was buried at Kabul. Babur's personality can be judged by his own memoirs Tuzk-i-Baburi, also known as Babur Namah, written in Turkish, personally transcribed by his son Humayun, and afterwards translated into Persian during the reign of Akbar. He was not only a brilliant general but also a great swordsman who had the quality of correctly gauging the strength and the weakness of the commanders and armies opposed to him. 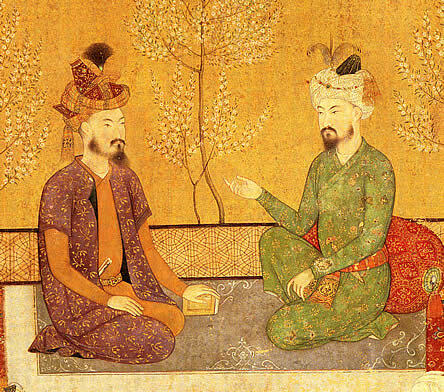 Babur was a man of extraordinary energy and strength. He had been known to take up a man under each arm and run with them round the battlements of a fortress. He swam and crossed all the rivers of the Indian Sub-continent. He was perpetually in saddle, riding 80 miles a day. 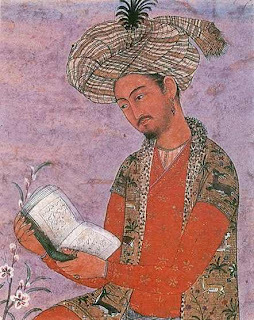 Babur was pre-eminently a man of faith. "Nothing happens" he used to say, "but by the will of God". 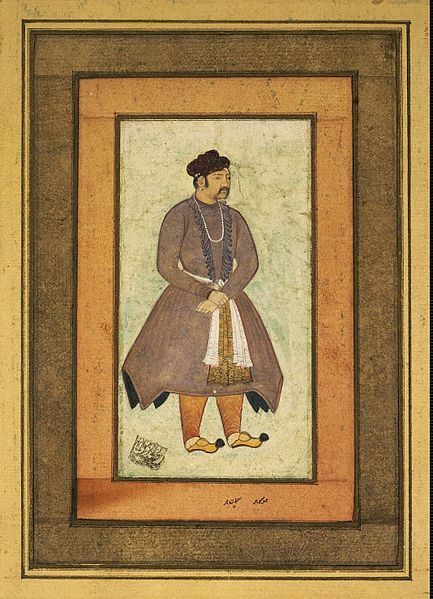 During his period of absolute rule over India, Babur did not have the time, or indeed the opportunity, to set the affairs of state in permanent manner. 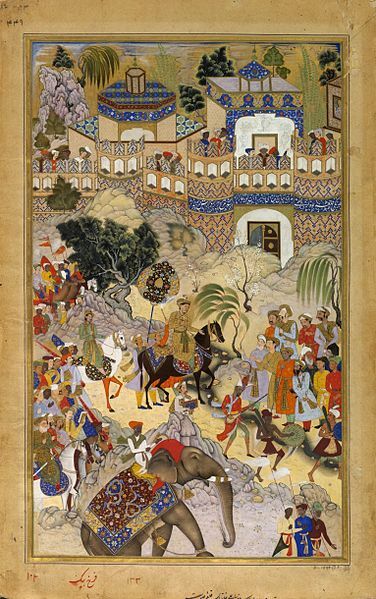 Babur on his death left an empire barely held by force of arms, and lacking any consolidated civil administration. After him his 23 years old son Humayun came to power to rule an empire set up by his father. 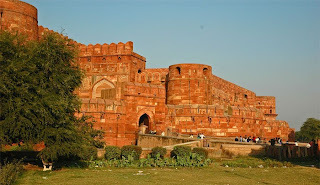 Akbar “The Great” was one of the greatest rulers in Indian history. He was born when Humayun and his first wife, Hamida Bano, were fugitives escaping towards Iran. It was during these wanderings that Akbar was born in Umerkot, Sindh, on November 23, 1542. 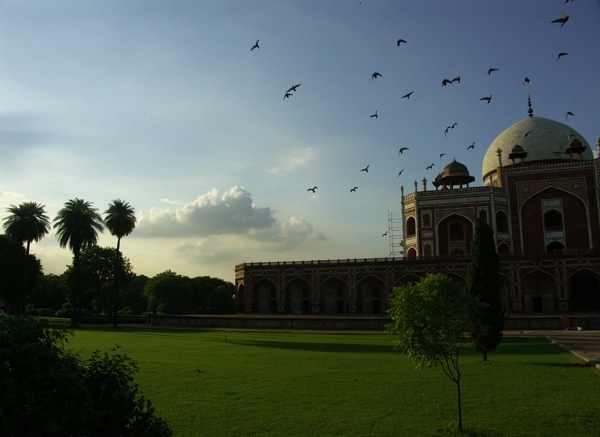 Legend has it that Humayun prophesied a bright future for his son, and thus accordingly, named him Akbar. 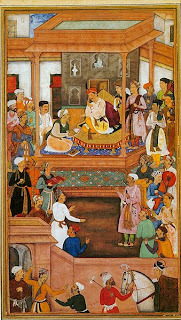 Akbar came to throne in 1556, after the death of his father, Humayun. At that time, Akbar was only 13 years old. 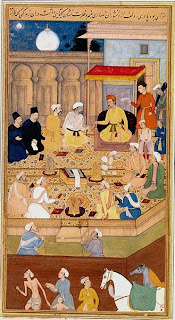 Akbar was the only Mughal king to ascend to the throne without the customary war of succession; as his brother Muhammad Hakim was too feeble to offer any resistance. 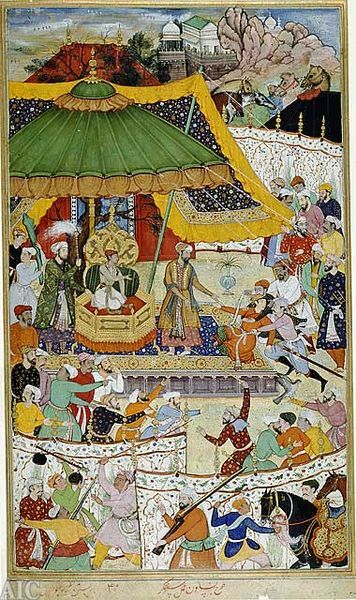 The court of Akbar, an illustration from Akbarnama. [ The fall of the Rajasthani fortress of Chitor in 1568, when the Mughal army succeeded in approaching the ramparts by constructing covered defences. 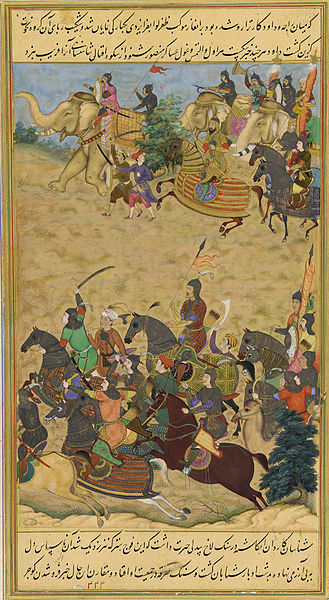 As Akbar surveyed the battle one evening, he took aim with his gun at a figure in the fort whose studded coat indicated that he was a leading enemy soldier. 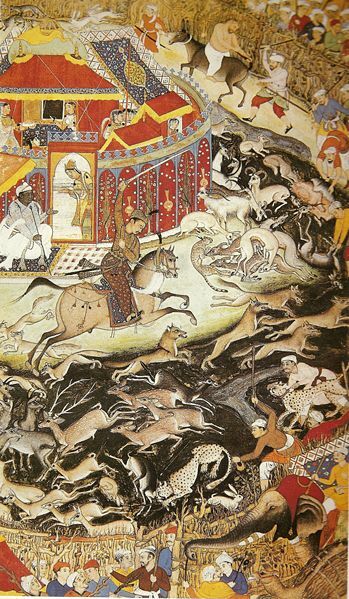 The shot killed the man, who was discovered to be the Rajput hero Jaimal. He is said to have been extremely moderate in his diet. 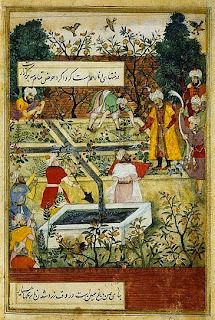 Ain-e-Akbari mentions that during his travels and also while at home, Akbar drank water from the Ganges river, which he called ‘the water of immortality’. Special people were stationed at Sorun and later Haridwar to dispatch water, in sealed jars, to wherever he was stationed. "As in the wide expanse of the Divine compassion there is room for all classes and the followers of all creeds, so... in his dominions, ... there was room for the professors of opposite religions, and for beliefs good and bad, and the road to altercation was closed. Sunnis and Shias met in one mosque, and Franks and Jews in one church, and observed their own forms of worship." The Akbarnāma , which literally means Book of Akbar, is an official biographical account of Akbar, the third Mughal Emperor (r. 1542–1605), written in Persian. It includes vivid and detailed descriptions of his life and times. 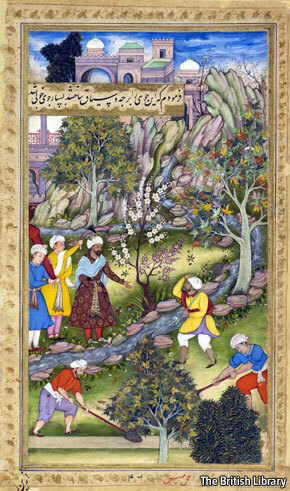 The work was commissioned by Akbar, and written by Abul Fazl, one of the Nine Jewels (Hindi: Navaratnas) of Akbar’s royal court. It is stated that the book took seven years to be completed and the original manuscripts contained a number of paintings supporting the texts, and all the paintings represented the Mughal school of painting, and work of masters of the imperial workshop, including Basawan, whose use of portraiture in its illustrations was an innovation in Indian art. Akbar was deeply interested in religious and philosophical matters. 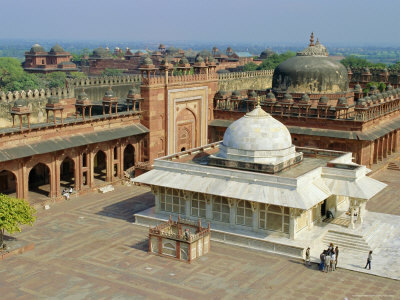 In 1575, he built a hall called the Ibadat Khana ("House of Worship") at Fatehpur Sikri, to which he invited theologians, mystics and selected courtiers renowned for their intellectual achievements and discussed matters of spirituality with them.Akbar's effort to evolve a meeting point among the representatives of various religions was not very successful, as each of them attempted to assert the superiority of their respective religions by denouncing other religions. 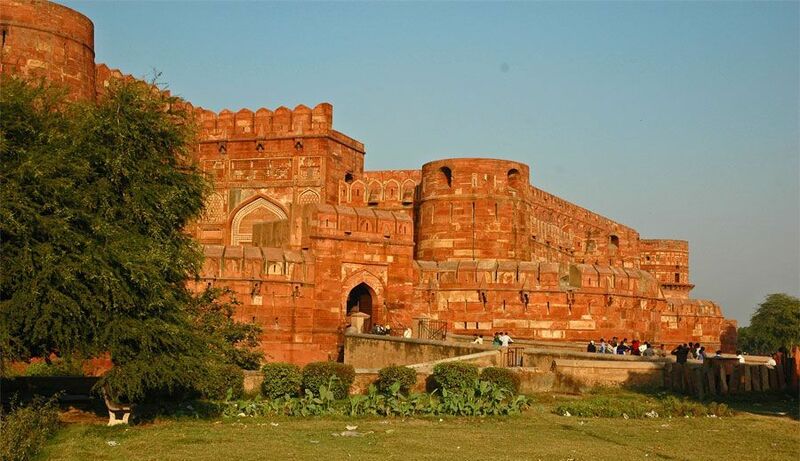 Akbar expanded the empire and started the golden period of Mughal architecture by building Agra Fort, Fatehpur Sikri, Humayun’s Tomb and other monuments. 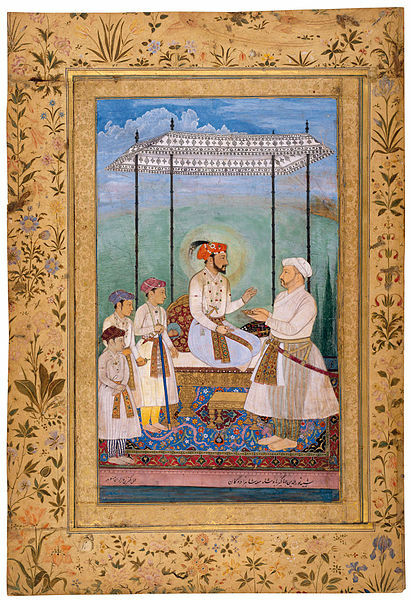 Akbar had three sons Prince Salim, Murad and Daniyal. Prince Murad and Daniyal died in their prime during their father’s lifetime. 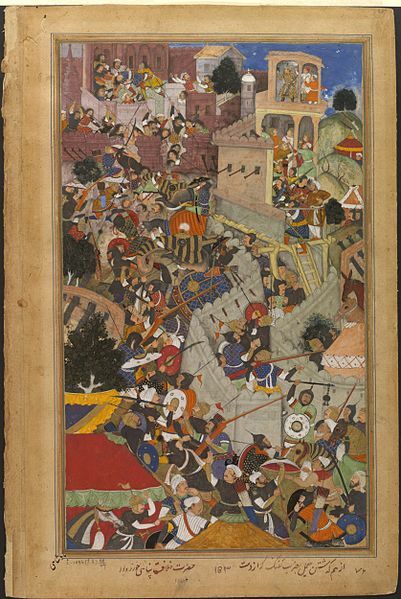 However, Akbar faced problems with Prince Salim and the last four years of Akbar’s life were consumed in crushing Salim’s rebellion. 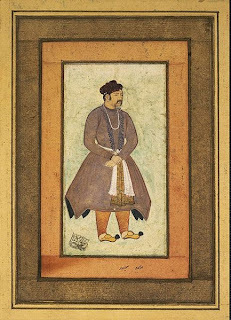 Akbar fell ill and died of slow poisoning on October 27, 1605. With him ended the most glorious epoch in Indian history. Akbar started building the Tomb in his lifetime around 1600. 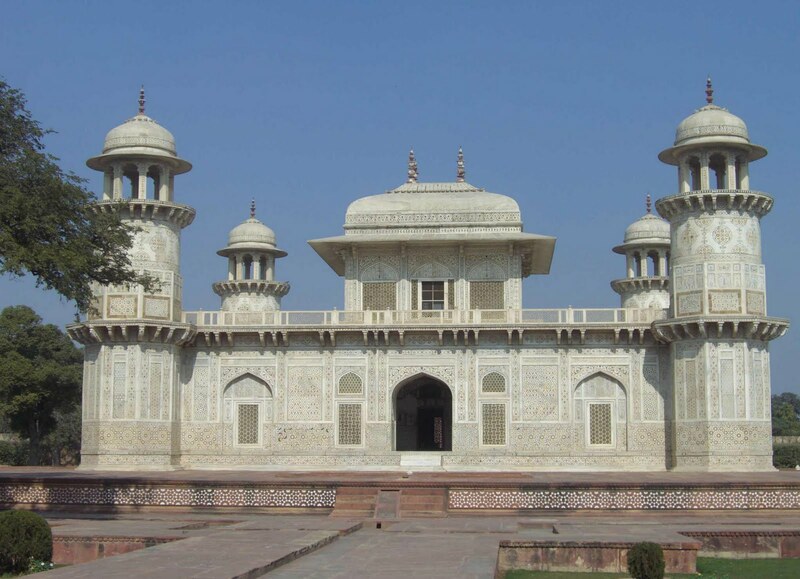 His son Jahangir completed the construction work between 1605-1613. Arjumand Bano Begum, entitled Mumtaz Mehal, “the ornament of the palace”, was the daughter of Asif Khan, brother of Nur Jehan, wife of Mughal emperor Jehangir. 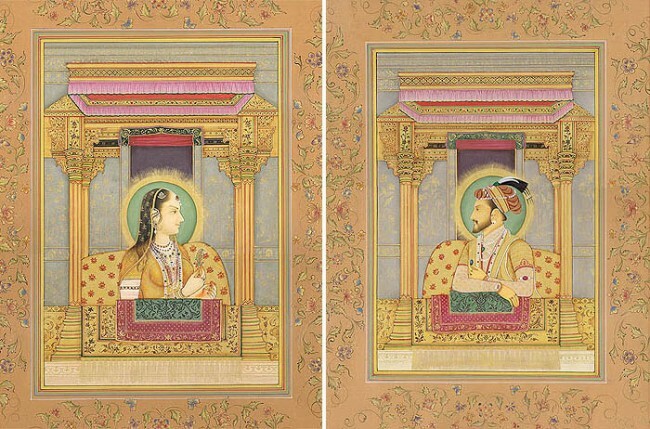 In 1612, Arjumand Bano married Shah Jehan, ruler of the Mughal Empire. 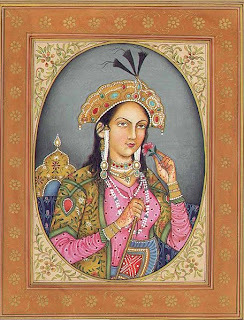 Mumtaz Mahal mothered fourteen children by Shah Jahan, including Aurangzeb, Shah Jahan's successor, the Imperial Prince Dara Shukoh the heir apparent anointed by Shah Jahan and Jahanara Begum, the Imperial Princess. 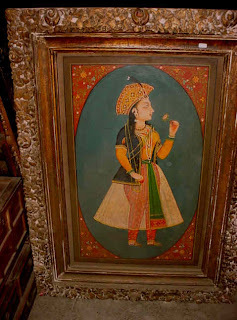 Arjumand Banu Begum was born in Agra into a family of Persian nobility, as a daughter of Abdul Hasan Asaf Khan, making her a niece (and later daughter-in-law) of Empress Nur Jehan, the wife of the emperor Jahangir. 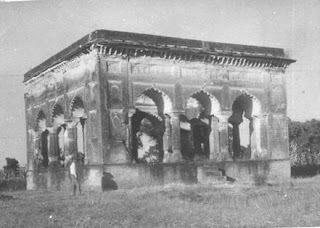 Her younger sister Parwar Khanum married Sheikh Farid the son of Nawab Qutubuddin, the governor of Badaun who was also emperor Jahangir's foster brother. 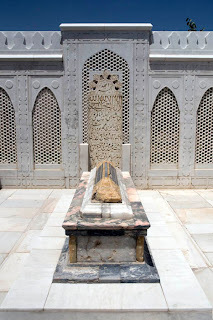 Empress Mumtaz was religiously indeed a Shia Muslim. 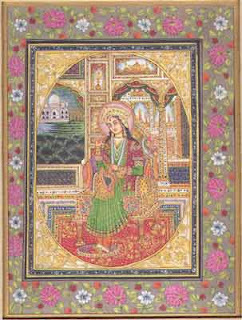 In 1607 AD (1016 AH), Prince Khurram, also known as Shah Jahan, was betrothed to Arjumand Banu Begum who was just 14 years old at the time. She would become the unquestioned love of his life. They would, however, have to wait five years before they were married in 1612 AD (1021 AH), on a date selected by the court astrologers as most conducive to ensuring a happy marriage. 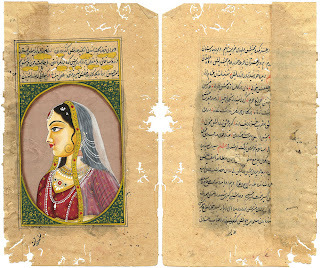 After their wedding celebrations, Khurram "finding her in appearance and character elect among all the women of the time", gave her the title 'Mumtaz Mahal' Begum (Chosen One of the Palace). 18 AH). The intervening years had seen Khurram take two other wives. By all accounts however, Khurram was so taken with Mumtaz, that he showed little interest in exercising his polygamous rights with the two earlier wives, other than dutifully siring a child with each. 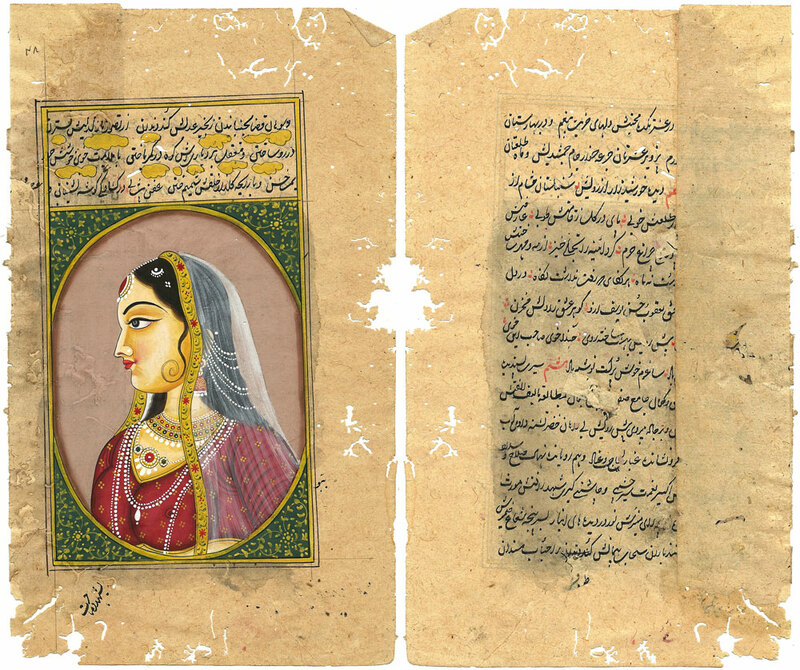 According to the official court chronicler, Motamid Khan (as recorded in his Iqbal Namah-e-Jahangiri), the relationship with his other wives "had nothing more than the status of marriage. 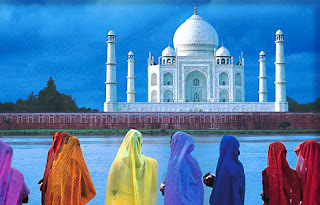 The intimacy, deep affection, attention and favour which His Majesty had for the Cradle of Excellence (Mumtaz) exceeded by a thousand times what he felt for any other." Mumtaz Mahal had a very deep and loving marriage with Shah Jahan. Even during her lifetime, poets would extol her beauty, grace and compassion. 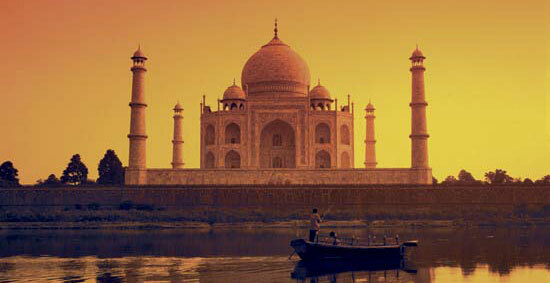 Mumtaz Mahal was Shah Jahan's trusted companion, travelling with him all over the Mughal Empire. 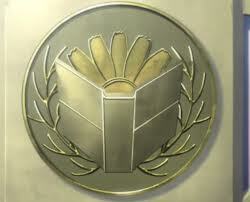 His trust in her was so great that he even gave her his imperial seal, the Muhr Uzah. 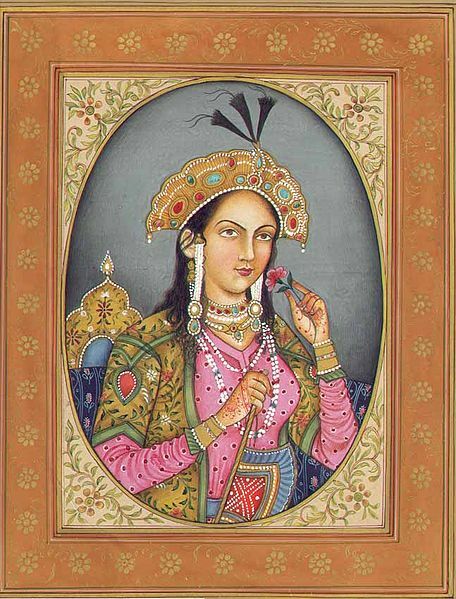 Mumtaz was portrayed as the perfect wife with no aspirations to political power in contrast to her aunt, Empress Nur Jehan, the wife of 4th Emperor, Jahangir who had wielded considerable influence in the previous reign. She was a great influence on him, apparently often intervening on behalf of the poor and destitute. But she also enjoyed watching elephant and combat fights performed for the court. 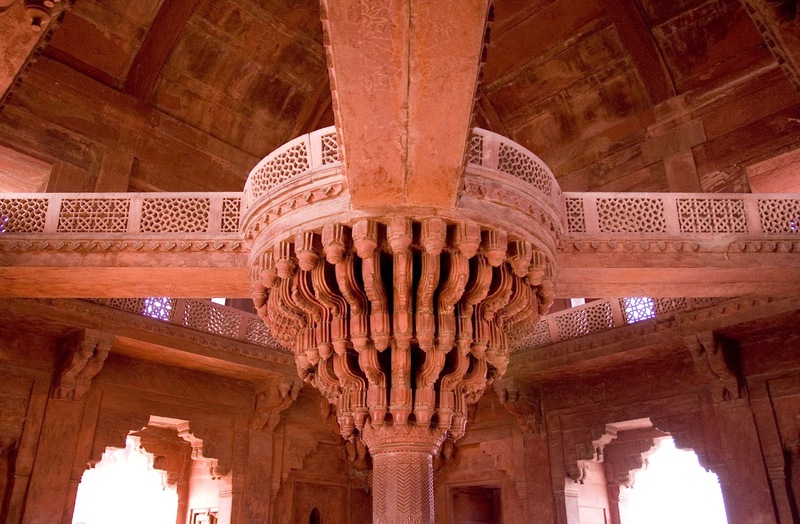 It was quite common for women of noble birth to commission architecture in the Mughal Empire. 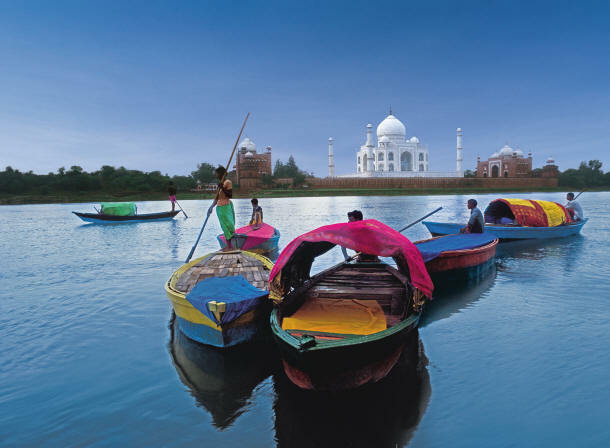 Mumtaz devoted some time to a riverside garden in Agra. 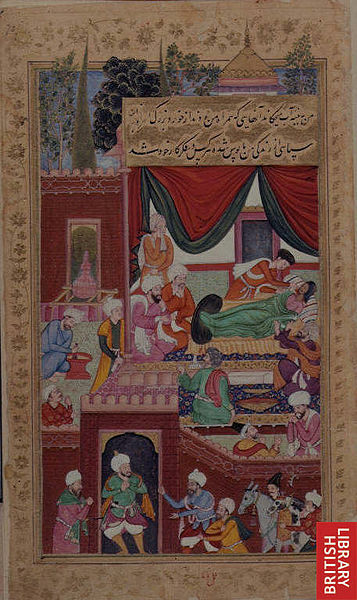 In 1631, Mumtaz Mehal died in childbirth at the age of 39. 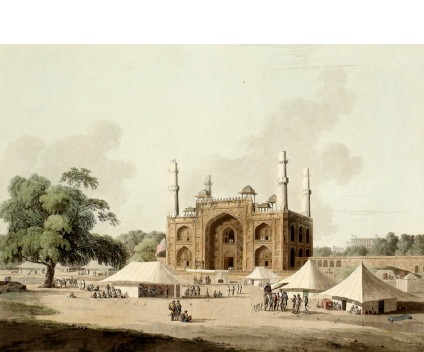 Her body was temporarily buried at Burhanpur in a walled pleasure garden known as Zainabad originally constructed by Shah Jahan's uncle Daniyal on the bank of the Tapti River. 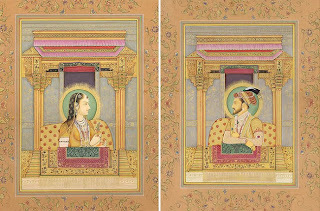 The contemporary court chroniclers paid an unusual amount of attention to Mumtaz Mahal's death and Shah Jahan's grief at her demise. 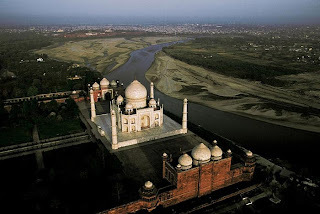 In the immediate aftermath of his bereavement, the emperor was reportedly inconsolable.Apparently after her death, Shah Jahan went into secluded mourning for a year.When he appeared again, his hair had turned white, his back was bent, and his face worn. 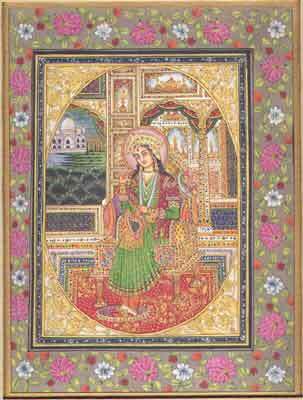 Shah Jahan's eldest daughter, the devoted Jahanara Begum, gradually brought him out of grief and took the place of Mumtaz at court. 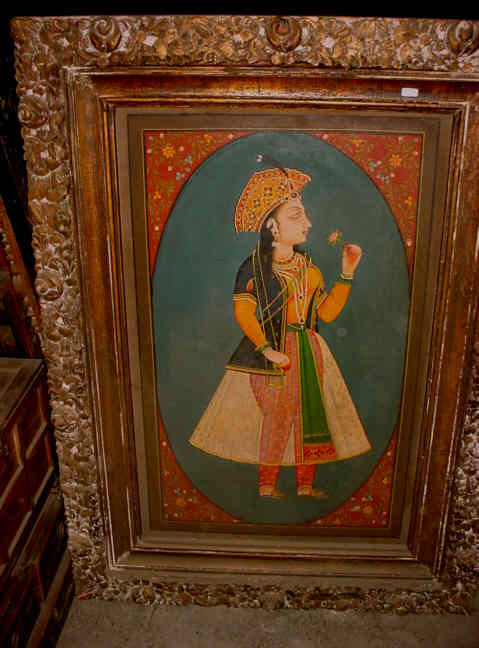 Her personal fortune (valued at 10,000,000 rupees) was divided by Shah Jahan between Jahanara Begum, who received half and the rest of her surviving children. Burhanpur was never intended by her husband as his wife's final resting spot. 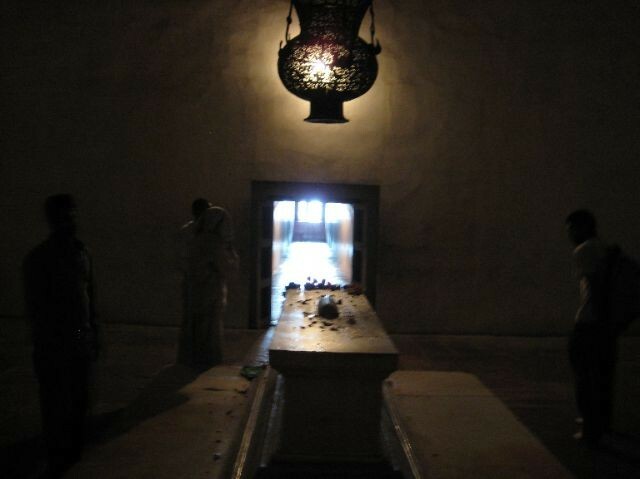 As a result her body was disinterred in December 1631 and transported in a golden casket escorted by her son Shah Shuja and the head lady in waiting of the deceased Empress back to Agra.There it was interred in a small building on the banks of the Yamuna River. Shah Jahan stayed behind in Burhanpur to conclude the military campaign that had originally brought him to the region. 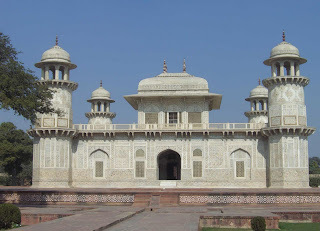 While there, he began planning the design and construction of a suitable mausoleum and funerary garden in Agra for his wife. It was a task that would take more than 22 years to complete: the Taj Mahal. 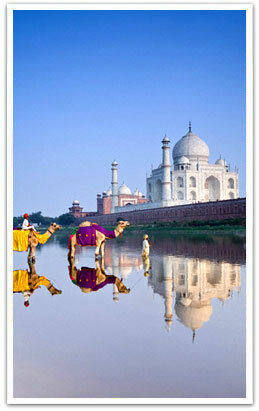 The main dome of Taj Mahal measures about 110 yards in circumference and is about 107 yards above the ground. The monument is standing in a lush green garden amongst fountains and floral plants and trees. The tomb is standing on a platform of red stones. 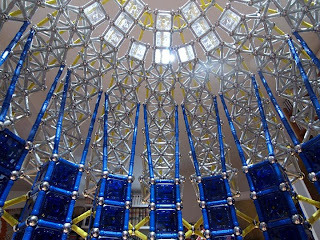 The material was brought in from all over India and central Asia and it took a fleet of 1,000 elephants to transport it to the site. Taj Mahal’s construction costed 50 lac rupees at that time. Taj Mahal is decorated with Gold, Rubies, Turquoise, Lapis lazuli, Sapphire and Diamonds. The verses of Quran are written in the passages in beautiful calligraphic styles. There is a beautiful mosque inside the monument. 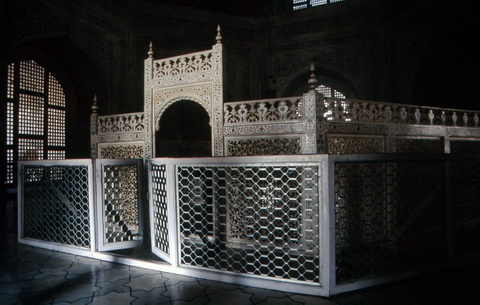 The Mughal emperor, Shah Jehan ordered the building of a marvelous tomb for his beloved wife. 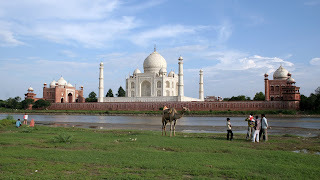 The tomb of Mumtaz Mehal is popularly known as Taj Mehal. 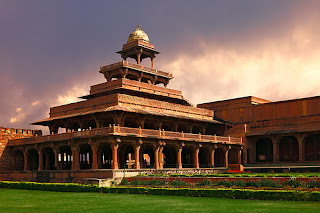 It is commonly considered as the most perfect example of the Mughal style and the most beautiful building in the world. 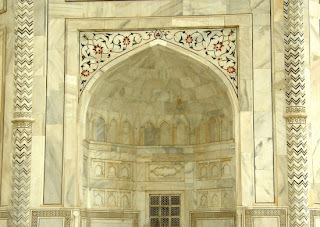 The entire mausoleum is made of marble. The exterior is paved with semiprecious stones arranged in Arabic inscriptions and floral designs. 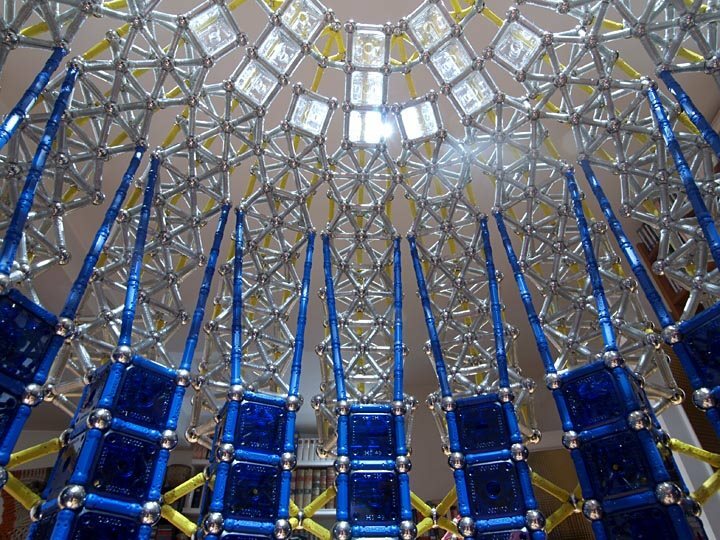 The interior is lavishly decorated in lapis, turquoise, agate, jasper, and colored marble. The surrounding garden contains four water channels. 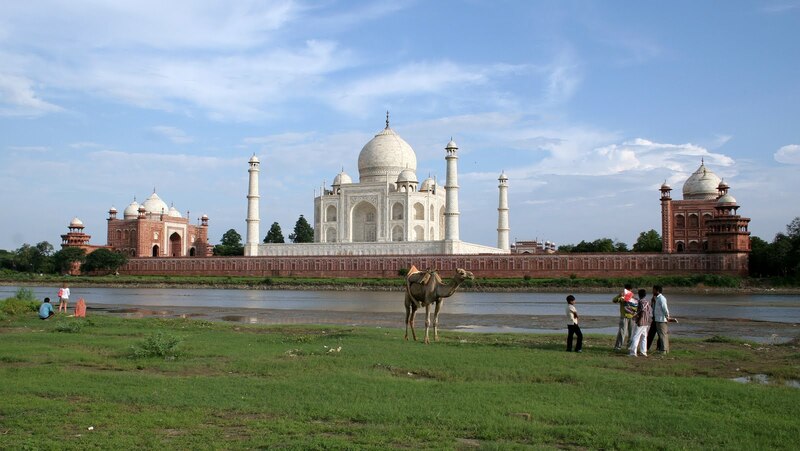 It took 20,000 workers, 1,000 elephants and nearly 20 years to complete this monument. 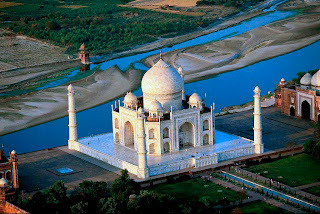 Mumtaz Mahal must have possessed uncommon charm and character to merit a magnificent memorial, such as no other lady in the world has ever won.